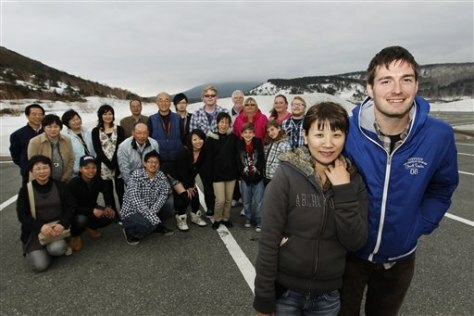 Johnathan Ryan, a native of Cape Coral, Fla., far right; his wife Shinobu and their family members pose for a photo May 1 by the crater of Mt. Azuma-Kofuji in Fukushima, Fukushima Prefecture, northeastern Japan. The two married on April 30 and live in Aizuwakamatsu, southwest of the city of Fukushima.